I have always found David Miliband irritating and patronising. But I have found him even more so ever since, when asked on British TV on the type of music to be found on his IPOD, he responded by ‘Classical’. This was a few days after his boss Gordon Brown had surprised the media by claiming his admiration for the Arctic Monkeys, an edgy Rock band from Sheffield. The contrast between the two answers in that time frame should give you an idea about the man’s psychology. 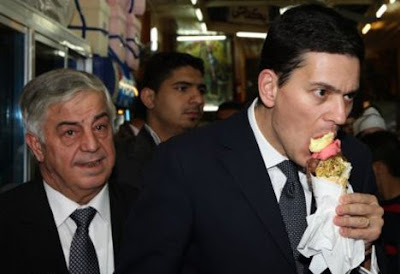 So watching him eat Ice Cream in Damascus’ s Old Quarter reminded me more of the ‘Englishman abroad syndrome’ than of a comfortable cultural exchange; A striking departure from the laid back Tony Blair. But this piece is not about Miliband, although he is likely to continue making the headlines in the future, possibly as a British Prime Minister one day. This piece is about Syria and its eternal potential as a ‘force of stability’ in the Middle East. Never mind the appearances, Western powers have always favoured working in partnership with the Assad(father and son)regime in Damascus, hoping secretly that they could turn him one day into the Hosni Mubarak pseudo-republic : authoritarian at home, moderate abroad and unquestionably serving their interest in the region. But again and again, the mutually beneficial relationship has failed to take off, with the guilty party being the Syrians. This is not out of some ideological principle, as they like to bang on about, specifically when taunting their ex-Lebanese allies now turned hardened Atlancisits. Syria has shown throughout the decades that its position as arch-enemy to the Zionist project is less permanent than it might appear to readers of the Baath, Teshrine and Al-Thawra (All official publications of the regime). Whether failing to support the Fedayeen in Jordan, fighting a half-hearted battle in Lebanon (1982,1996), joining the anti-Iraqi coalition in 1991 or defending its own borders against repeated airborne aggressions (2007,2008), the Syrians have always a White Flag in reserve. At the first hint of interest from anyone in a suit and a foreign accent the Syrian Nomenklatura is seen welcoming, wining and dining or feeding Ice Cream. And for some strange reason what is acceptable in Damascus is certainly anathema in Beirut. The reason has less to do with the credentials of the current Syrian Leaders. After all none of them lost limb fighting the Americans or a son resisting the Israelis. The credentials used are those of Damascus as a well established centre of power with historical significance in the Arab and Muslim World. A seat of the Khilafa and (adopted) home of Salahuddin, to be reckoned with in war and peace. In contrast Beirut seems a hybrid rebellious cousin, to be tamed rather than be reasoned with. On that point Assad, Sarkozy and the Anglo-American axis agree. The problem remains that Syria is unable to offer the veneer of democracy required by public opinion in Europe and is still hoping to obtain more than Israel is willing to give up in the occupied Golan Heights. With the Israeli Skiing season starting shortly, the Europeans know that. This visit might have more to do with Anglo-French rivalry than Middle Eastern hopes for Peace. Where Sarkozy treads Albion will follow!